Danielle, Emily and Connie, three adult sisters living in a mid-size urban Ontario community, share their path of transition in creating a successful move to living independently together in an apartment in the same neighborhood as their parents. This is a journey about three siblings and their parents, which began two years ago and expanded to extended family and friends during the last 6 months prior to their May 2016 move. Independent Facilitation was paramount in this transition process. When Connie’s independent facilitator met with the family, she talked with the sisters about what dreams they had for themselves and to their mother about the family vision. The facilitator recognized the family’s proactive initiative toward making this transition to independent living for the three sisters. She listened to each of the sisters and the parents, wanting to make sure that each of the sister’s voices were heard and the family vision was expressed. Since each of the sister’s had their own facilitator, it was important that they all worked together to make this dream a positive reality. The three facilitators worked collaboratively to maximize resources, and found that the sisters had some shared dreams, like attending cooking classes together. They also had individual dreams including, Connie’s interest in making new social connections, Danielle’s dream of having a puppy one day, and Emily’s hope of working by providing home cleaning services in the future. 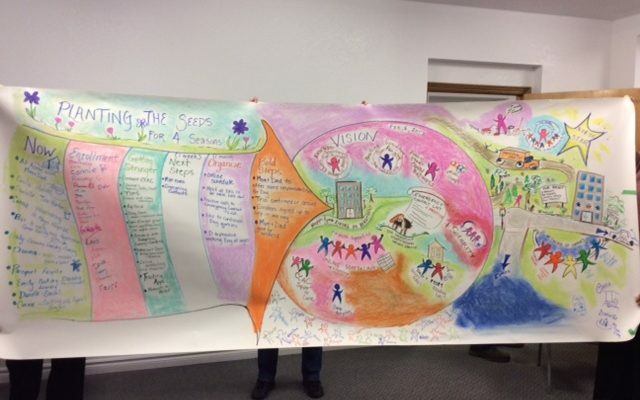 How could facilitation assist with implementing the sisters’ dreams and the family vision? What were the concrete steps that they could take? The facilitators began with these questions and developed a strategy with the family of how to expand relationships among friends and extended family to assist with the transition and the dreams. The sisters and the parents were excited about the idea of holding a planning session with other people in their network. 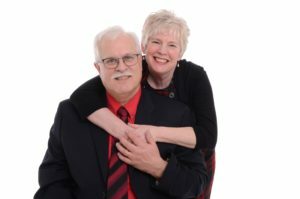 They began by creating an invitation list that ultimately provided a foundation of commitment from a strong community network of natural support from family and friends. Meeting for several hours, this planning process with 30 people created a PATH that outlined the dreams, action steps, and concrete ways that this network of caring people could participate in the transition process. 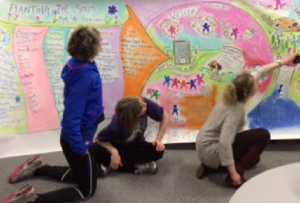 This network of family and friends explored questions around how they could contribute to the girls’ dream of living independently together in the neighborhood. These supportive and trusting relationships of family and friends continue and have strengthened a sense of community and feeling of safety and support. One of the facilitators emphasizes that, “Tools and principles in the power of bringing people together was exemplary, and created such a positive and proactive energy.” The planning session and the calendar helped everyone in the extended network to know what is happening, what the family needs, and how support circle members can help. Lynn reflects on the move to the apartment, noting that the path planning session created confidence among supporters because it brought the community together, and enabled deeper relationships to develop. Everyone feels that without the path planning session it would have been much more work. As Lynn says, the planning day turned into joy and building of community.” Lynn adds. “I was getting so tired and I know even over the move in May, it was physically draining… but there were all these people offering to hang the pictures…they (our community network of family and friends) took over. It was this huge weight lifted; that support to be able to stay put…and my sister-in-law is running the calendar for family and friends to use for planning.” For the family, the move and the network that were created were a gift! Lynn adds, “That path planning was in January and the energy and connections have continued. We are going to Australia for three weeks and I feel so good about it.” With planning and facilitation, new and sustaining connections with community, friends, and family have been identified, built, and continue to be developed in support of the hopes and dreams of Connie, Emily, Danielle and their parents’ lives.